First Line: When a large object falls from a great height, the speed at which it travels accelerates until the upward force of air resistance becomes equal to the downward propulsion of gravity. Cambridge University students seem to be ahead of the curve in one disturbing statistic: they're committing suicide much more often than their counterparts elsewhere. Not only that, but they're doing away with themselves in ever more bizarre and astounding ways. Although each student's death appears to be suicide, there are enough similarities in their backgrounds and behaviors that the police are not convinced that the victims acted alone. More and more, it seems that someone might be targeting insecure students and luring them to their deaths-- and if that is what's happening, this person must be driven out of hiding and caught. Detective Inspector Mark Joesbury believes the best way to do this is to recruit Detective Constable Lacey Flint to go undercover as a student. As Lacey gets deeper into her role as a vulnerable young woman, the lines begin to blur. Is she drawing out the killer... or is she rapidly becoming the perfect victim? S.J. 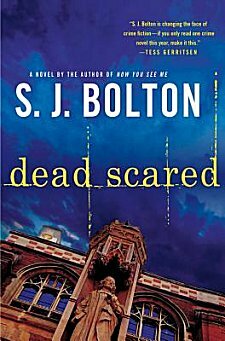 Bolton has become my go-to author for well-written thrillers that have complex, exciting plots and characters with depth. This is my second meeting with Detective Constable Lacey Flint, who was last seen in Now You See Me giving me a lesson in showing respect for the River Thames. She throws herself into her role of vulnerable university student even though it isn't always a good fit, but there are areas of her life, of her innermost self, that she's extremely protective of, and the killer in Cambridge seems quite skilled in preying upon her weaknesses. Another character, Dr. Evi Oliver, head of student counseling, has her own problems, only one of which seems to be as the target of cruel pranks. She drew me in even further whenever she appeared in a chapter. Speaking of chapters, Bolton's tend to be quite short-- reminding me of motion-sensitive security cameras that take a picture whenever something trips the sensor. The points of view shift from Lacey to Mark Joesbury, to Dr. Oliver, and even the time frames pivot from the present to nineteen years ago to five years ago, which reinforce the security camera feeling. It's up to the reader to put all these images, all these observations and conversations together in an attempt to discover what's going on. The short chapters and shifts in point of view and time are not off-putting; however, they serve to keep the reader's blood pressure creeping up, and to keep the story moving at a very fast pace. The Cambridge setting adds to the atmosphere of the book. A map of the area allowed me to follow along with the action, and the descriptions of the old streets and buildings are so evocative that I found myself wanting to plan a visit. Although this is the second of Bolton's novels to feature Lacey Flint, it's not necessary to read the first. Bolton provides just enough backstory to prevent confusion and to entice the reader to pick up Now You See Me (which wouldn't be a bad idea at all). The only thing that prevented me from giving Dead Scared my highest rating is that, although I tend to be the type of reader who can rapidly suspend my disbelief and sink into just about any story, the plot here was a bit too far-fetched for me to buy into it whole-heartedly. But that's a very small complaint compared to all the rest of the riches in this book. S.J. Bolton is an author that I recommend highly. I'm going to read this one very soon. Maybe even next. I'll think about it overnight. I haven't read any other books by this author, but she has been on my list for quite some time. I think you'll really enjoy her, Kay! Cathy - Oh, now this one does seem interesting! I love the academic setting (What can I say, I'm a sucker for that!). I liked several things about another Bolton novel, Awakening - have you read that one - but that too pushed the limits of credibility here and there. Still, really solid pacing and so on. I think that's one of two of Bolton's novels that I haven't read-- but I have them both sitting on my TBR shelves! I really liked this book. Yes, if you think about it, maybe some parts of the plot are improbable,but reading it that did not occur to me. I was sold.. The thought would pop into my mind, but I would kick it back out, saying to it "I don't care, leave me alone!"